Soft pretzels are a stand by of craft breweries – and they are easier than you think! These easy, homemade Helles Herb Parmesan Pretzels are made using everyday ingredients and of course, beer! 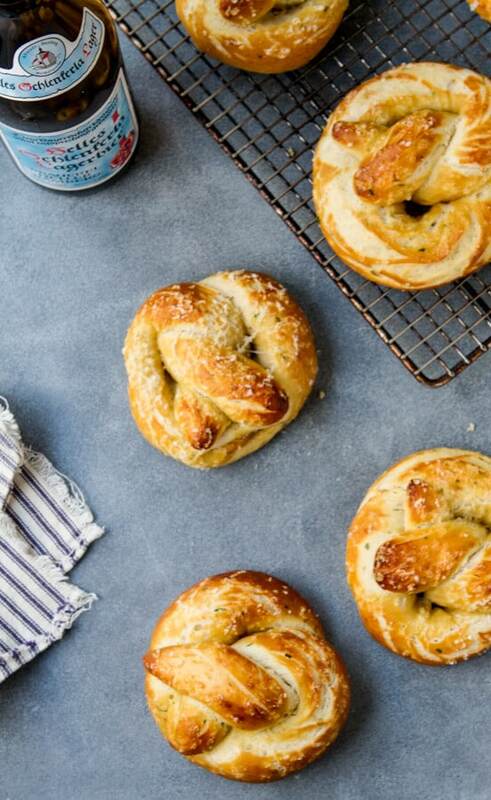 Craft beers aren’t just for drinking – they add incredible flavor to both sweet and savory recipes like these Helles Herb Parmesan Pretzels. Much and all and I’d like to take credit for these Helles Herb Parmesan Pretzels, I can’t. 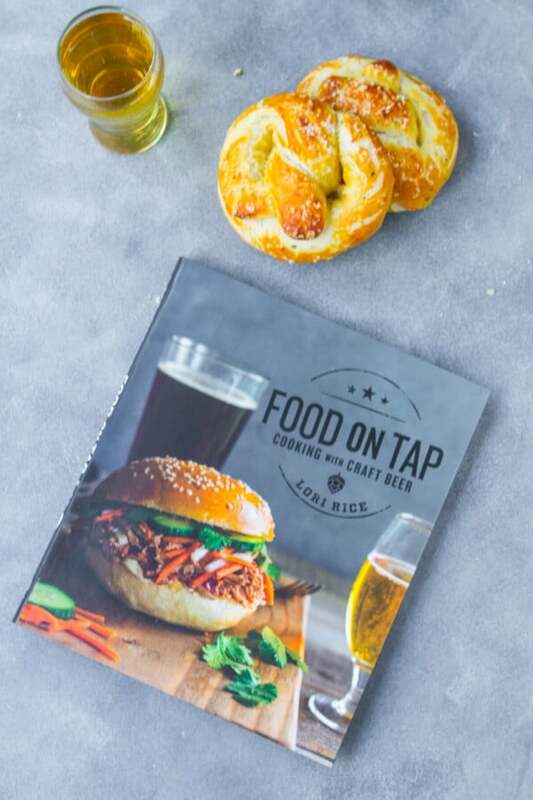 They are the creation of my good friend Lori Rice – whose new book “Food on Tap – Cooking with Craft Beer” has just hit bookstores. Filled with easy and inventive recipes I had very hard time deciding what to make first – but settled on these Helles Herb Parmesan Pretzels. One because I LOVE pretzels and two, because with some major football watching sessions ahead I knew these would be a hit with my crew. So I will warn you – plan on making two batches because if you aren’t careful, the first will disappear while your back is turned (true story). German Helles (or Munich Helles as it’s sometimes known as) has malty, breadlike notes that really lends itself beautiful to pretzel doughs. An easy and very drinkable style, it is worth seeking out!! If you can’t find it, Lori recommends a German Style Pilsner. I’ve included a list of her suggested beers for this recipe below!! 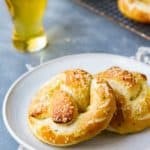 These Helles Herb Parmesan Pretzels are fabulous – a little chewy, yeasty with light, herbal notes from the herbs and a slight maltiness from the beer. The parmesan provides just the right salty note – a truly dynamite combination so… see my advice above! With the holiday season almost upon us, this book is a no brainer for all your beer loving friends! Tuck in a few bottles to use in the recipes (and maybe a kitchen gadget or two!) and you’ve got a fantastic gift for all the beer drinkers on your list! And if you want to try some other dishes using beer, check out my Crockpot Beef and Beer Stew – Carbonnade Flamande! Soft pretzels are a stand by of craft breweries - and they are easier than you think! 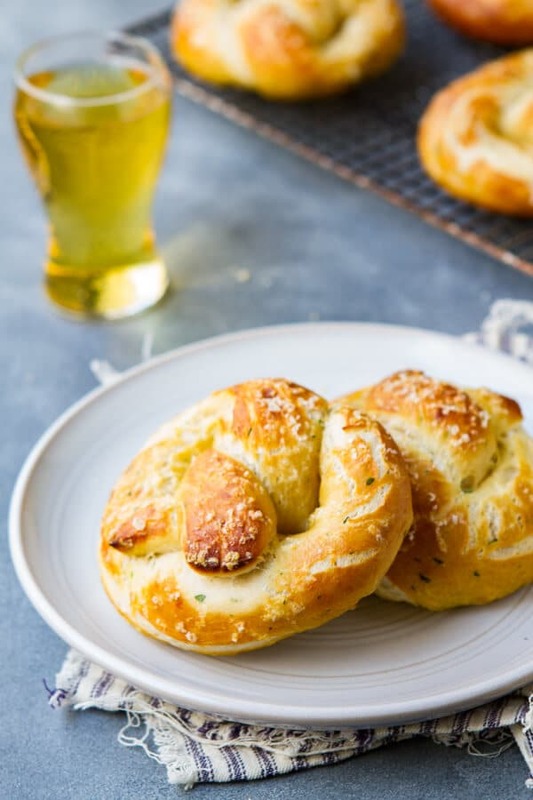 These easy, homemade Helles Herb Parmesan Pretzels are made using everyday ingredients and of course, beer! 1/2 cup water heated to 110 to 115 degrees. Extra virgin olive oil for coating the bowl and brushing parchment. Stir together the warm water and the sugar, and then stir in the yeast. Let sit until the yeast blooms, 3 to 5 minutes. Add the flour to the bowl of an electric mixer fitted with a dough hook attachment. With the mixer on low, pour in the yeast and then the beer. Continue to mix until combined, about 1 minute. Mix in the melted butter and then add the parsley, dill, chives and salt. Let the mixer knead the dough as it becomes a smooth ball in the center of the bowl, about 3 minutes. Transfer the dough to a floured surface and knead by hand until smooth and elastic, 3 to 5 more minutes. Coat a large bowl with olive oil. Place the dough in the bowl and cover with a clean dishtowel. Let rise in a draft free place until doubled in size, about 1 hour. Bring 3 quarts of water and the baking soda to boil in a large soup pot. Punch down the dough and roll back into a ball. Roll each piece into a thin cord, 22 to 24 inches long. To make each pretzel, form the cord into a U shape. Bring both ends to touch and twist them together once or twice. Fold the ends back down to the base of the U shape and press them into the bottom of the pretzel. Working one or two at a time, drop the pretzels into the boiling water. Boil until they float, 60 to 90 seconds. Remove with a slotted spoon and place on the prepared baking sheet, about 4 pretzels on each sheet to allow for spreading when they bake. Stir together the egg and water in a small bowl. Brush each pretzel with the egg wash and sprinkle with Parmesan. Bake for 10 to 12 minutes, until golden brown and baked through the center. These are best eaten the same day, but they will stay fresh in an airtight container up to 24 hours.